David Duke, the infamous neo-Nazi who also prides himself as being the former Ku Klux Klan Grand Wizard, is making headlines after he shared his big secret about Rep. Ilhan Omar. In fact, reporters are shocked saying this might be the final straw for the Congresswoman from Minnesota who is under fire for her anti-Semitic remarks. Don’t miss this. David Duke has a long history of anti-Semitism and identifies himself as being a member of the American Nazi Party. Duke has been the scourage on the fringe of American politics for almost 50 years. To understand why this story is so important regarding Rep. Omar, we have to go back to 2016 and the Trump campaign. Even though candidate Trump had never met Duke, the vile former Grand Wizard said he was endorsing him for president. Many think someone in the Clinton campaign paid him off, but regardless, it happened and Donald Trump immediately disavowed him. Yet, the Democrats used that to paint Trump as a racist. In fact, this is where all the racist crap started. Now, David Duke has gone beyond endorsing Rep. Ilhan Omar. He says she is the most important person in Congress today, and much more. 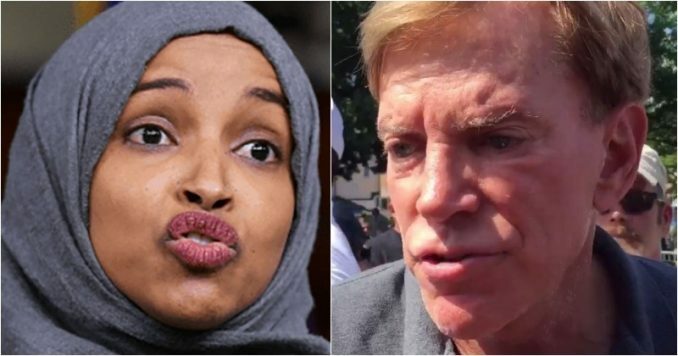 “David Duke, the former Grand Wizard of the Ku Klux Klan and an open racist and antisemite, is publicly defending Rep. Ilhan Omar (D-MN) in the wake of the freshman Democrat’s series of antisemitic statements that have rankled the Democrat Party nationally,” Breitbart reports. Omar is wrong on many things, open borders for instance, but even most republicans did noting about our borders. But the Muslims did not change our laws , open our gates, or teach our people to hate themselves – The Zionist Occupied Media & Gov did. The Zio Stranglehold must go! This is not the first time Duke has taken up Omar’s cause either. Back in early February, when she first came under the national spotlight for anti-Semitism at the beginning of the new Congress, Duke backed her up publicly as well. Duke’s decision to back Omar now comes in the wake of several Democrats, including House Speaker Nancy Pelosi and presidential candidates like Senators Bernie Sanders and Elizabeth Warren, as well as many other Democrats, refusing to demand that Omar apologize and attempting to explain away her comments as somehow not deliberately anti-Semitic. So, where is all the outrage by the mainstream media? David Duke just adores what Omar has done in Congress. Think about that. This neo-Nazi may have endorsed Trump, but that’s nothing compared to his love of Omar. He is really taking the policies the Congresswoman stands for and her statements to heart, claiming it’s just what he has been waiting for. “Second, every Democrat should be asked, in light of Duke’s embrace of Omar, why the Democratic caucus shouldn’t be seen as Duke-friendly because it refused to adopt a resolution specifically denouncing Omar’s anti-Semitism,” the Washington Examiner adds. “David Duke just said the most important member of Congress is Democrat Ilhan Omar because of her anti-Semitic remarks. Remember when he said nice things about Trump? Despite Trump denouncing it, the media covered it for weeks. Where is the media outrage over this?” tweeted Charlie Kirk. Where is the media outrage over this? It’s high time the leftist media treat Omar like they did Trump. Every American wants to hear her disavow everything David Duke has said about the Jews. Let’s see if she is willing to do that.